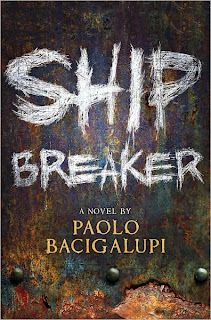 About a quarter of the way through listening to Paolo Bacigalupi's Ship Breaker, I found out that it was the first in a series and groaned inwardly. I am tired of books in series and want nothing more than to finish a book and feel as though I have completed the whole story arc. Luckily, upon finishing the book, I realized that Ship Breaker is not the first in a series but is actually just one of two novels set in Bacigalupi's post-Apocalyptic world, and the companion novel The Drowned Cities does not continue the same story. Yay! Ship Breaker is set in a shanty town that used to be New Orleans. The city and most like it along the Gulf Coast have flooded completely due to extreme hurricane activity. The Arctic has melted, too. The 99% and the 1% have become even more extreme. In the midst of all this is Nailer, a teenage boy whose job is to salvage the valuable copper from shipwrecks to sell to a big Indian company owned by the Patel family. After a huge storm, he and his best friend Pima come upon a beautiful ship full of riches and lay claim to it, thrilled to have come across something that has so much value, giving them the ability to leave behind their hellish lives. Unfortunately for them, there's someone still alive on-board, Nita. Nailer chooses to help Nita instead of to kill her and take the money, and that decision sets his life on a completely different track. This book started off very slowly for me. I didn't exactly understand the world in which it was set and the rules that governed Nailer's life. I also had a lot of trouble visualizing some of the settings. Nailer lives in a gritty, unsympathetic place. His father is an abusive drug addict, his mother is dead, he trusts no one except Pima and her mother. I admit part of the reason I pushed through on this book was because it had a very diverse group of characters. Nailer is at least part Hispanic, his friend Pima and her mother are Indian (though they are portrayed with some sort of Caribbean accent in the book) and Nita is Indian, too. There are many different religions mentioned in this book, as well as the underlying belief in luck and fate. In many ways, this book was written for our current state of affairs in the US. Nailer and Nita have little in common in background. Nita claims that her family runs a "clean" business that doesn't engage in black market activities, and Nailer practically points out that it's ridiculous to claim a business is clean when you employ small children in dangerous jobs to get your recycled materials for you. Nita is appalled that Nailer can't read and has no access to medical care, and Nailer is mystified that Nita seems to think there are moral decisions involved in making money. Nita says that her father has worked very hard to get where he is, and Nailer says that he has been working hard every day of his life, but that will never make him rich. While these conversations were interesting, they didn't really make the book stand out - after all, everyone in the world has engaged in that topic of conversation at some point in the past few years. But there is more here, too. There is genetic engineering and the way that "purebred" humans look down on those who have mixed genes, and how that creates a slippery slope that leads to a form of slavery. There is Nailer's father, who fills everyone with terror when he is high, which is nearly always. There's the abject poverty Nailer lives in, knowing that there is little likelihood that he will ever get out, and the way that knowledge impacts the people around him. I could say something cheesy about how this novel focuses on the redemptive power of friendship and forgiveness. And it is about that, but it hits on many other topics as well. I think that there are many stories ripe for the writing that Bacigalupi might use to explore some of those other themes. I was actually disappointed the second wasn't really a sequel! LOL But the companion novel does use one character from the first. "gritty, unsympathetic place" definitely captures the tone of these books! I love reading series, actually, but I am terrible with loyally finishing them. I'm looking forward to this one, despite that, however: glad to hear that you found it worthwhile! I like reading a series if it's a good series viz Megan Whalen Turner or Patrick Ness, but if it's not going to be good or can't be sustainably wonderful, I'd much much rather a one-and-done so I don't have to keep feeling guilty about never finishing the others. This was a great book I loved everything about it. How Nailer saves lucky girls life and much more. I would recommend this book to anyone above the age of 13 because of some swears that some parents may not like. Its a great read hope you enjoy it!